I feel safe in offering up challah as the final bread in this week of Christmas breads; for challah, like the bagel, has long ago entered the panary repertoire of the goyim, no longer a strange or foreign item. But the grouping is still apt, as challah is a celebration bread in Jewish tradition, as the rest of the breads this week have been. 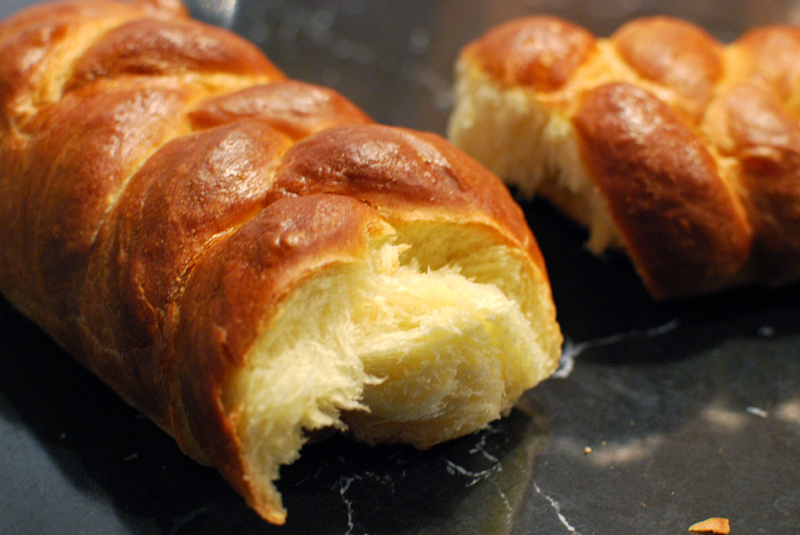 Generally speaking, challah is made with a rich dough, like all the other breads this week have been. But unlike them, it is only mildly sweetened to the point of being nearly savory, and only eggs are used to enrich the dough (as opposed to milk and/or butter), so that the bread may be eaten with meat according to Jewish dietary law. The gluten structure is well formed here, giving each airy bite a slight pull and pleasant chew. This recipe uses a lengthy fermentation, giving a fabulous depth of flavor, and excellent texture. As has become customary in the last century, this loaf is braided, and can be split into however many strands you like (the recipe only uses a 3 strand braid). But however you choose to form it, this recipe will produce a really excellent bread, no matter if it’s served at your Shabbat meal, or used for the French toast you whip up on Christmas morning. 1. In the bowl of a stand mixer, whisk together the flour, sugar, salt, and yeast. Add the oil, eggs, egg yolk, and 1 cup water. Using the dough hook attachment, mix at low speed until a rough dough forms. 2. Increase the speed to medium-low, and continue kneading until the dough becomes soft and supple, about 6 minutes. The dough should not be sticky; add additional flour or water as needed to correct the consistency. 3. Turn the dough out onto a lightly floured surface. Shape the dough into a ball by pulling the outside edges into the center, and pressing gently. Transfer the dough to a large, lightly oiled bowl, rolling it around to coat it with oil, leaving the dough smooth side up. Cover tightly with plastic wrap, and let stand at room temperature for 1 hour. 4. Using a large nonstick spatula, tri-fold the dough over itself, as you would fold a letter. Fold the dough in half, perpendicular to the other folds, as though you were folding the letter in half crossways. Cover again with plastic wrap, and let sit an additional hour at room temperature. The dough should be not quite doubled in size. 5. Turn the dough out onto a lightly floured surface, and gently deflate. Divide it into 3 equal pieces for 1 large loaf, or 6 pieces for 2 loaves. Form each of the pieces into a rope as long as the dough will allow, cover loosely with plastic wrap, and let rest on the counter for 10 minutes. 6. Lightly grease a large baking sheet, or line with parchment paper. Roll each rope into a strand, all of the same length. Braid three strands together. Transfer the loaf (or loaves) to the prepared pan. 7. Beat the remaining egg white with 1 tablespoon water to make an egg wash. Brush the loaf (or loaves) with the egg wash (refrigerating the remainder). Cover loosely with lightly oiled plastic wrap, and let sit at room temperature until nearly doubled in size, 60 to 75 minutes. Thirty minutes before baking, preheat the oven to 350° F, placing an oven rack in the middle position. 8. Gently brush the loaf (or loaves) again with the egg wash, taking care not to deflate. Bake at 350º F for 20 minutes. Rotate the pan 180º and continue baking for 20 to 45 minutes, depending on the size of the loaf (or loaves). The bread should be a rich golden brown, and and instant-read thermometer should register around 190° F when inserted into the center. Transfer the bread to a wire rack to cool for at least 1 hour before serving. This entry was posted in Savory, Sweet, Yeast Breads. Bookmark the permalink.